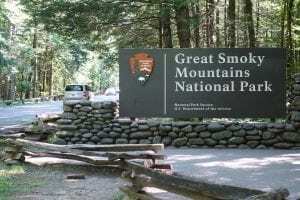 The Smoky Mountains National Park is one of the most-visited in the entire country! There are around 850 miles of hiking trails for you to explore during your visit, each with their own unique views. Now you just have to decide which one you want to visit first! To help you make the most of your trip, here is a list of the top 5 Smoky Mountain hikes you have to try! Hike to Laurel Falls and you’ll see why it’s one of the most visited destinations in the national park! The roundtrip distance to the waterfall is 2.6 miles, and it takes about 2 hours to hike there and back. The 80-foot waterfall has two levels with a bridge crossing over the upper one. You’ll definitely want to stop and take a few pictures before heading back. This is one of the Smoky Mountain hikes in the national park that is paved. However, the pavement is rough and uneven in certain spots, so wheelchairs and strollers are not recommended. If you plan on bringing the little ones, just be sure to keep a close eye on them. If you’re looking for an easy hike, give the Gatlinburg Trail a try! It travels 1.9 miles one-way to the outskirts of Gatlinburg from the Sugarlands Visitor Center. It is relatively flat, making it a popular choice among bicyclists, joggers, and walkers. It is one of many Smoky Mountain hikes that offers beautiful wooded views. You will also be traveling alongside the West Prong of the Little Pigeon River. You can even cross the river at one point on the pedestrian footbridge. The Alum Cave Trail is famous for its interesting landmarks and scenic views. At 1.3 miles, you’ll come to Arch Rock, a geological marvel, formed by wind and water eroding away the softer rock. The trail also passes right under it, providing a great place for photos! At the 2-mile point, you’ll see Inspiration Point, a rocky outcrop where you can look out over the valley and surrounding mountains. At 2.3 miles, you’ll finally come to the trail’s namesake, the Alum Cave Bluffs. From here, you can either choose to turn back or test your skills as you hike to the summit of Mount LeConte. The Andrews Bald trail starts from the Clingmans Dome parking lot and travels 1.8 miles one-way to the bald itself. Depending on the time of year, you may even be able to spot find patches of blackberries and raspberries! 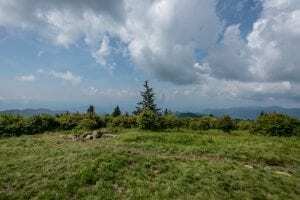 Once you reach the Andrews Bald, you can either choose to continue down the Forney Ridge Trail or hike back to the parking lot. However, before moving on anywhere, you’ll want to stop and take in the views! Grotto Falls is another one of the Smoky Mountain hikes in the national park that features a waterfall. The roundtrip distance to the 25-foot falls and back is 2.6 miles and takes about 2 to 3 hours to complete. The cool, moist environment near the falls is also ideal for salamanders, so you might get the chance to see some up close when you get there! Get back in tune with nature the next time you visit and give these Smoky Mountain hikes a try. However, if you want all the views minus the work of hiking, we’ve got you covered! Come see us at CLIMB Works and you can enjoy 360-degree panoramic views of the Smokies and learn about their rich history on every platform. Our dual zip lines even allow you to share the experience with friends and family. Learn more about our zipline tour and start planning your adventure!